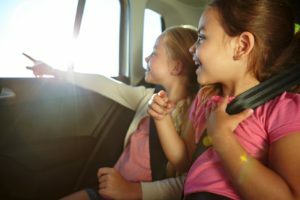 Is car time turning into screen time for your kiddos? It doesn’t have to. In fact, you can use this valuable time to teach them about the world around them. Turn even the shortest car rides into fun and educational experiences with these car games. I’m going on a picnic and I’m going to bring…..
Pretend you and your child are planning a picnic. You and your child can take turns saying what you’re going to bring, such as a blanket, plates, food, etc. As you add to the list, see how many items you and your child can remember. Your picnic list doesn’t need to be in alphabetical order, just think of as many items as you can. When you get to your destination see how many objects from the list you and your child remembered. How many items in a given category can you think of? Pick a category such as desserts, colors, farm animals, or things to wear. Then list all the items that fall under your chosen group. Try to make the longest list you can without repeating any words. Play this fun guessing game with your child on short or long car rides. Think of a person, place, or thing, but don’t tell your child what you’re thinking of. Let’s say you’re thinking of a certain animal. Let you child ask you yes/no questions to see if they can figure out which animal you’re thinking about. Your child might ask: Can the animal fly? Can the animal swim? Can the animal live in a house? Once your child guesses correctly, it’s their turn to think of a person, place, or thing and your turn to ask them yes/no questions to figure out what they have in mind. Look out the window and find the letter “A” anywhere on a sign. Once you find an “A,” look for a “B” on another sign. To make the game more challenging, tell your child the letter you’re looking for must occur at the beginning of a word. Adults can start this game by saying a person’s name i.e. “Jen.” Then, it’s the kid’s turn. Kids need to say a name that begins with the last letter of the name the adult said. For example, if the adult says, “Jen,” the child could say, “Nancy.” Play until one of you cannot think of a name that starts with the last letter of the previous name. Take turns being the one to start the game. Create a short story while riding in the car. Take turns saying a sentence or two that forwards the action of your story. You can start with a sentence like, “Once upon a time there was a frog.” The child might add, “The frog followed me to school.” Take turns saying sentences until your story has a beginning, middle, and end. Take turns starting the story too. Playing games with your children is as necessary for their development as it is fun because play is how children learn. Almost any activity can be turned into a game, making it easy to sneak in playtime when you’re riding in the car, tidying the house, or running errands. Aren’t playdates great? They are a great way for your child to not only develop relationships with other children, but also practice social and communication skills, taking turns, sharing their things, and switching between activities. I am totally agree with you. I also think that playing games with your children is as necessary for their development as it is fun because play is how children learn. Thanks for the sharing your valuable thoughts over here.